If you have been reading my blog for a little while you might be aware that I love polymer clay. It is such a great medium to work with and the possibilities of what you can create with it are endless. It's like an adult version of playdough (that you bake) and once you get the hang of how to work with it you will never want to stop playing. 1. Choose your brand wisely. 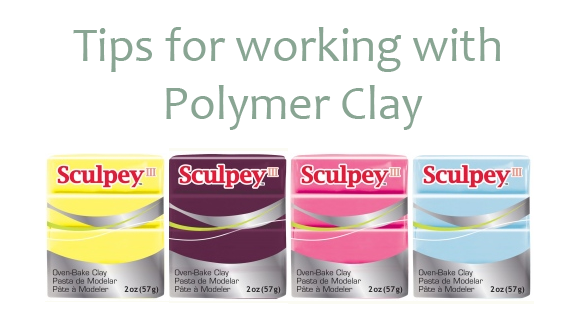 I have tried a few different brands and the clay that I have the most success with is Sculpey. 2. Always condition your clay before you get started. By warming the clay in between your hands and softening it up you will help prevent cracks after it is baked and it will be easier to work with. 3. Wear latex gloves to prevent fingerprints if your clay is really soft. 4. Do not get discouraged if your clay creation is not what you pictured. You can always mash it up and start fresh. That's that best part about working with polymer clay! 5. If you don't see a color you like when picking out clay, make your own custom shade by mixing colors together. This takes a little bit of time but I have discovered the best shades (like this one) by mixing my own colors. 6. If you are carving something from clay (see this post) stick your clay in the fridge for 6-8 minutes to harden. This will make carving so much easier. 7. Store unused clay in a zip lock bag and keep it in a cool place out of the sun. 8. If you are making bracelets (see this post) wait until your piece has fully hardened and cooled before trying it on. If you are impatient and do not wait it will break. I learned this lesson early on. 9. Always work on a really clean surface. Polymer clay is sticky and will pick up anything. 10. Have fun! The beauty of handmade is that is does not need to be perfect. Little imperfections will make it unique and special. I will be following up this post with a fun polymer clay diy soon! I just bought some clay - can't wait for the diy. Thanks for the tips. Ok my friend I have a question! A few weeks ago my sisters and I were trying to make those twist bracelets, but we definitely miscalculated on the sizes. How do you make them large enough that they will fit you, but not too large that they'll slip off? Or do you just wait 24 hours and then put it on instead of the 2 hours that we waited and then they broke! Yay! Thanks Lindsay!! All the questions I had, now answered in one easy place! (Instead of me tweeting you all afternoon while working with the clay.) :) You're the best! My clay guru, haa! xo! Those are great tips--some that I learned from trial & error. :) Thanks friend! You are the polymer clay expert!! These are really great tips. Thanks for sharing friend!! Oh, I've just planned some diy with it! I'm posting my first polymer clay project in the next few days. You've got me hooked! Thanks for posting these tips, I'm going to give it a go. Just put it on my craft supply list! wish me luck! Oh good tips! I still haven't used polymer clay yet... you have so many good jewelry pieces that I want to make but haven't had the time! I love the green ring you made. What colors did you mix? if is not too much to ask. I just love your clay DIYs! Thanks for these tips. I have to ask though... Are these bracelets easily breakable? Like if it falls, or you hit your wrist somewhere. I would be so hurt to drop it and have it shatter! Thanks for the tips! I still haven't bought clay but when I do I will need these! The only problem I've had is baking the clay - I have some pieces i have baked 3 times at the suggested times and temps and nothing is hard enough to use as a bangle. The clay is always a little soft after it cools I have tried the sculpty and the craft smart. you have literally became my new best friend, I have very large hands and it is so hard to find bracelets that fit me and using your polymer clay bracelet creation guide I have made my own, keep up the amazing work! I just made my first bracelets today (meh, need practice), and ran across some interesting safety guidelines on working with PC...after the fact, of course. What are your thoughts/experiences as far as the tools, area, and oven you use? I just had to buy new cutting boards and rolling pins because I'm so paranoid we'll be eating microscopic bits of plastic! I just wanted to add a tip that I learned this week. I hope it is ok. I sometime get clay that is really hard and dried out. If you smear it with vaseline and put it in a ziploc bag it softens back up in about 24 hours. this also work on fimo clay which is just a hard clay but has so many beautiful colors. Can you roll the clay in glitter for some sparkle before baking to bake it in?